Lamina Hydraulic Drill Heads - T.R. Goldsmith & Son, Inc.
Six different drill heads are available to work interchangeably with the Lamina Hydraulic power unit. 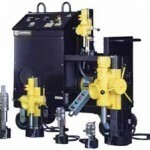 Key Features:Rugged steel construction, Drilling or tapping cannot begin until the magnet is turned on. Fixturing can allow step drilling larger diameters. Drill Heads can be fixtured for special applications. 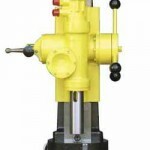 The magnetic base attaches to the drilling surface at almost any angle, including vertically and horizontally. Safety devices should be used when drilling horizontally or overhead. *Please Note: Due to the size and weight of the Lamina Hydraulic Drill Heads, you will be contacted regarding shipping costs. Please click to visit the Dayton Lamina’s website for further information.